According to data gathered by Sensor Tower Store Intelligence, the iOS App Store has seen iPhone and iPad users around the world download roughly two million ARKit apps every four weeks over the past six months. The research firm is tracking what it calls "ARKit-only" apps, or augmented reality software built "expressly" using Apple's framework. Apps that include only minor ARKit integration such as value-added AR features like photo modes and mini games, were not included in the tally. Unsurprisingly, games accounted for 47 percent of cumulative downloads in the firm's last check, up from 35 percent when Sensor Tower issued an inaugural report on ARKit apps in October. In second place are utility apps like AR rulers, a segment that contracted from a 19 percent share of downloads in October to 15 percent this month. Entertainment apps like virtual pet simulators hit 12 percent, while the Lifestyle category more than doubled its share of downloads, jumping from 5 percent to 11 percent. Photo & Video, Education and Other bring up the rear with shares of 6 percent, 4 percent and 7 percent, respectively. 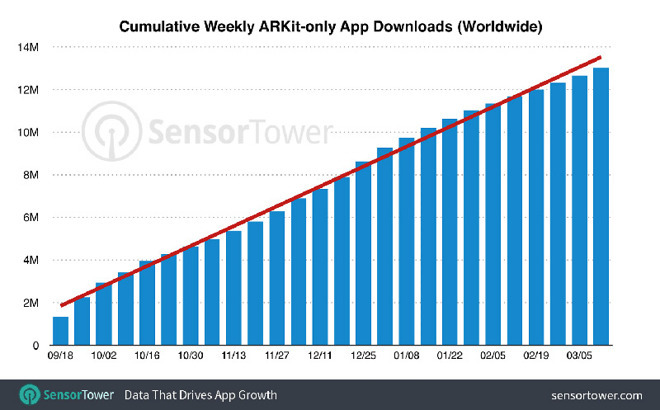 Similar to traditional apps, ARKit titles that gained an early following continue to perform well in Sensor Tower's metrics. Shopping app IKEA Place, sticker app GIPHY World, battle game The Machines and VR pet My Very Hungry Caterpillar AR are examples of top apps that continue to draw in users. Consumers were first introduced to IKEA Place, GIPHY World and The Machines through various Apple keynotes, including the introduction of ARKit at WWDC 2017. As for overall top performers, popular virtual pet app AR Dragon led the free app space over the past six months, while dimensioning app CamToPlan Pro topped both the paid app and highest grossing charts, the firm said. According to Sensor Tower, there are more than 2,000 ARKit-only titles on the iOS App Store, and that number continues to grow as developers find new and novel uses for the augmented reality framework. Most recently, Apple released an update to ARKit, dubbed ARKit 1.5, alongside the first iOS 11.3 beta release in January. With the new technology, developers can build apps capable of detecting vertical and irregularly-shaped surfaces, as well as images like posters and book covers.